Aside from the set photos producer Roberto Orci shared when the film was in production, we haven't seen much from the anticipated Ender's Game. And with Summit moving the film's release date from February to November 2013, that's not all that surprising. We passed the year-to-go mark last month, so we should hopefully be seeing some official looks at the movie in the coming months. Sure enough, we get our first official peek today! Ready to see Ender Wiggin and Colonel Graff together? Written by Orson Scott Card, Ender's Game is a sci-fi story set in the future where man is at war with an alien race called Formics (or "Buggers"). The brightest children are recruited to attend a space-set battle school to train for the fight, which involves strategic games and other lessons. The story follows Ender Wiggin (played by Asa Butterfield in the movie), an underdog of a character who proves to be especially adept at battle training and strategy. His intelligence is matched by his compassion, which makes him as interesting a character as he is a potential leader. And speaking of leaders, Harrison Ford plays Colonel Graff in the film, one of the leaders at the Battle School who takes an interest in Ender, believing he's mankind's last hope of defeating the Formics. With that general background in mind, we have our first look of the movie, which comes courtesy of EW, and shows Ender and Graff face to face in the dormitory at Battle School. In this scene, Ender is facing off with Graff over whether his emails to home are being blocked. Those familiar with the book know that Ender is especially close with his sister Valentine (Abigail Breslin plays her in the movie), which could be who he's trying to get in touch with, if not his parents. Ender's relationship with his sister is an interesting part of his character development and the same can definitely be said for his relationship with Graff as Ender attempts to size Graff up and figure out what his game is. In the above photo, Ender's standing with the other launchies, all of whom are new to Battle School. Not only do we get a look at the two leads, but we also get a glimpse of the set. But the really exciting aspect is the serious looking profiles of Ford and Butterfield. The enemy's gate may be down but Colonel Graff is dead ahead as he stares Ender down. Ender being older than he is in the book might diminish some of the impressiveness of his accomplishments, but in the end, I'm optimistic that it won't drastically change the story. And with our first look of the film, now we can be greedy and hope for more in the coming months. Perhaps a teaser or a poster? 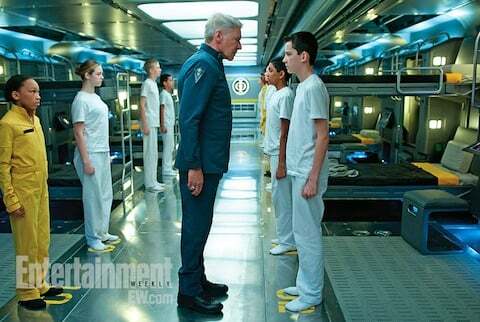 Ender's Game arrives in theaters November 1. More information can be found in our Blend Film Database.